Captain Ben Morehouse has been working the East Coast waters for the last 15 years. He has been all around Key West and the Florida Keys, and prior to that he had experienced the different fishing styles found in Cape Cod. However, for the past eight years Key West has been Captain Ben's home and where he plans to stay. Upon moving to the Key West area in 1998, a commercial fishing operation was born in Key West. Captain Dan has all the experience that you need to have a profitable charter. He seeks to build a relationship with his clients that other Charter Captains seem to avoid. Key West waters are like home to him and when you step aboard the Outcast, you become like family. This is just one of the reasons his charters are as successful as they are. When you travel with Captain Dan, you will not feel like you are traveling with a stranger. Instead, you will think an old friend is guiding the boat to the fish-filled destination that the Captain has chosen. 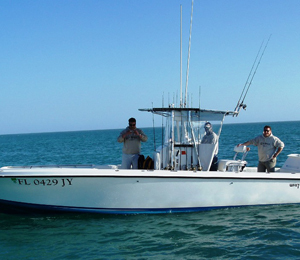 Captain Ben's boat is the 28-foot, Whitewater fishing vessel that is known simply as The Outcast. Powered by twin 150HP Yamaha Outboard engines, the Outcast is built to perform successfully in a number of water environments. Equipment for your fishing excursion is provided for free when you are fishing with Captain Ben. Of course, seasoned anglers are likely to have a favorite rod and if that is the case Captain Ben looks forward to seeing it. Bring it along and let it lead you to the fish! Additionally, all necessary licensing is handled through Captain Ben, so it will not be required on an individual basis. Captain Morehouse does recommend a few things that should be brought on your trip. While these things are not all mandatory, having them could greatly improve your enjoyment and ability to relax while on board. Standard items like white soled deck shoes, sunscreen, and Polarized Sunglasses are recommended on most tours of this kind. Additionally, Captain Ben recommends bringing along a change of clothes, including a long sleeve shirt and some pants to guard from the possibility of the constantly shining Key West sun. Other recommended items you might want to bring include some lunch with beverages for a snack while you are on the hunt for all those fish. I have been to the Bahamas many times, but The Outcast is one of my favorite trips! It includes everything that everyone should do here. As a Bahamas veteran, I can say only the best about this experience!